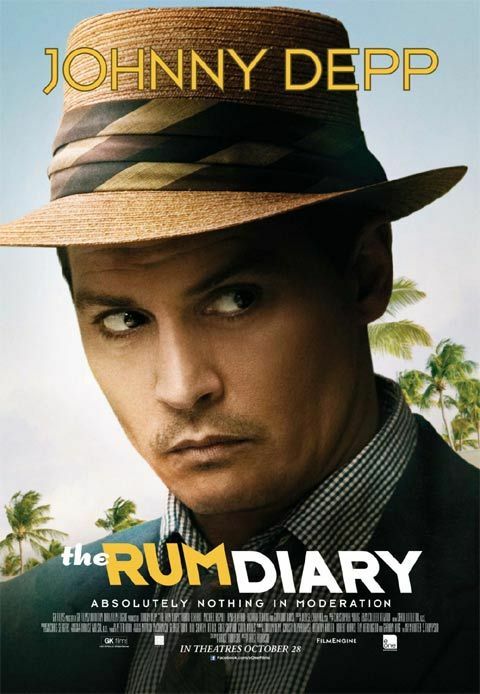 From Christina Radish, at Collider.com, comes a revealing interview with Johnny Depp and Bruce Robinson about the making of The Rum Diary. Director, Robinson was both Depp AND Thompson's pick to direct Fear and Loathing in Las Vegas but he wasn't available at the time so they went with Terry Gilliam. So when everything came together to put The Rum Diary on the screen, Depp wanted to honor Thompson's choice even though Robinson hadn't worked in years. Apparently it took almost three years to convince Robinson to do it! One look at the trailer for Bruce Robinson's Withnail and I - also a semi-autobiographical film - is enough to understand both Depp and Thompson's thinking. Johnny Depp clearly had a deep affinity for Thompson. The friendship and deep respect which began with preparation for Fear and Loathing in Las Vegas and continued up to his death (Depp didn't just attend Thompson's funeral; he blew his ashy remains out of a canon!) still has a hold on the actor today, as is evidenced in this snippet from Ms. Radish's interview. ROBINSON: We had this ritual, every day. We had Hunter’s chair with a script and the Dunhill cigarettes and a bottle of Chivas Regal, on the rocks. Every morning, before we started work, Johnny and I would stick our fingers in the Chivas and put the perfume of whiskey behind our ears, to celebrate Hunter. This was for him. DEPP: Most definitely. Initially, it was the idea of keeping Hunter’s spirit alive for us, on the set. But, I knew that I had Hunter with me. When I put my pillow on the bed at night, I had him with me. He was there. That became addictive for everyone. The actors would go and dab. The crew would go and dab. It was all for Hunter. I've been trying to avoid the reviews and waiting to see the film when it opens tomorrow. I'll let you know what I think. I hope you'll do the same!